Drawly is creating an Art Book! Hi! My name is Yoanna and I extend my warmest thanks to you for stumbling onto my Patreon page! I've held a pencil in my hand for as long as I can remember. For me, drawing and painting are the purest, simplest of ways to convey one's thoughts, desires and emotions. It's also really cool to be able to draw your favourite characters in silly situations! Feel free to check out my Facebook page and my official website for a taste of what I can do! I have been roaming this Earth for 1/4 of a century. It may not seem like much to some, but for me that's an entire lifetime! And while I still have much to see, experience and feel, I have already met such an unbelievable range of emotions. And if there's one thing I've learned, it's that we are woven by our duality. We would not know happiness were it not for sadness; we wouldn't recognize sheer bliss if not for excruciating grief. It's those zig-zagging feelings and their rich contrast that let us know that we are alive. I aim to capture and portray these emotions, just the way I see them, in an art book. So it's only natural that this book would be titled "Upside/Downside". Just as our own emotions, the art book will be devided into two opposing halves. You'll have to flip the book all the way around to see the other side of the scope. I've already begun my journey, but I have a ways to go and I need your help. If you decide to support my project, you are absolutely brilliant! I cannot wait to show you my art! Access to my Doodle Book! Thank you so much! Have a digital High Five! Dandy WIPs of my art with some helpful tips and insights! Credit to your name after all my future YouTube videos! A monthly request which you can choose via poll! Step-by-Step phases of my art! For each month at this tier, I'll create a simple commision for you! I'll send you a signed copy of my book titled "Upside/Downside" once it's finished! Your support is out of this world! Remember that commision from the previous tier? Once I'm done, I'll send a signed print your way! I will show the world how awesome you are and personally thank you! 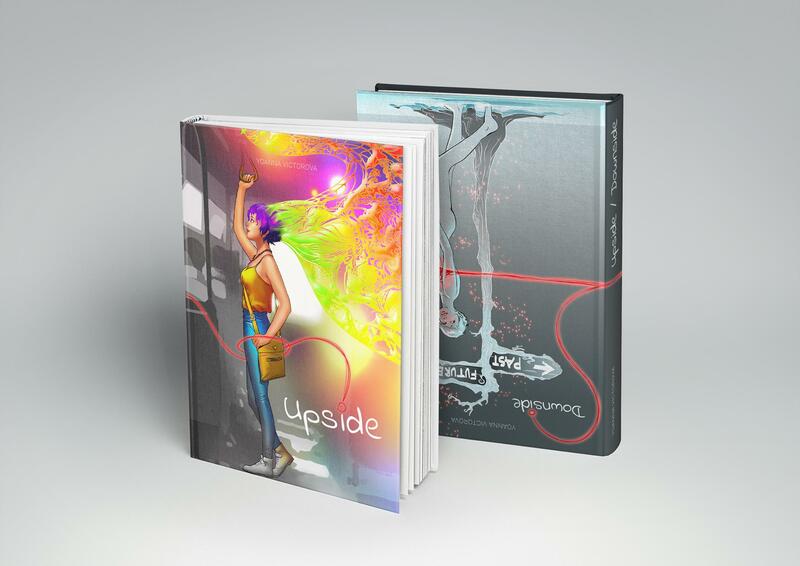 I will be able to concentrate on pouring my heart and soul into the artbook I've always dreamed of creating - "Upside/Downside".